"This report explores the challenges and opportunities represented by the complex interrelationship between forests, agriculture and sustainable development. It demonstrates that the sustainable management of both forests and agriculture, and their integration in land-use plans, is essential for achieving the SDGs, ensuring food security and tackling climate change." "State of the World’s Forests 2016 shows that some countries have been able to reconcile the aspirations of the different sectors, increasing the agricultural productivity and food security of their populations while also halting and even reversing deforestation. The report presents case studies for seven such countries, and others have made similar transitions. The challenge today is to encourage such positive trends in countries – especially low-income countries – in which food insecurity is still rife and where forests are still being lost." 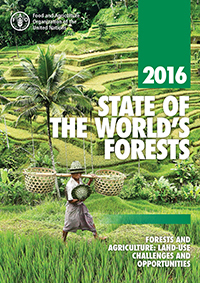 Souce: FAO " State of the World’s Forests 2016, in brief".